This weekend brings the first round of the NFL playoffs, and you&apos;ll be sure to see some amazingly clutch throws, resilient defensive stands, and game-winning field goals. However, you&apos;re also sure to see fourth-quarter fumbles, untimely butterfingers, and boneheaded coaching blunders. Money-Makin&apos; Malcolm Gladwell famously noted the distinction between choking and panicking in sports, but whatever you call the moments in this countdown, you can file them all under one category: #EPICFAIL. 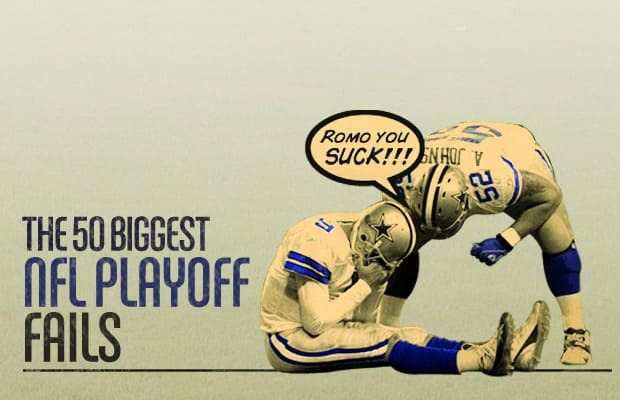 Without further ado, check out Complex and 6Magazine&apos;s 50 Biggest NFL Playoff Fails of all time.